Brothers in Arms Hell's Highway brings the critically acclaimed squad-based WWII shooter into the next generation of gaming with amazing graphics and sound, new cutting-edge gameplay features and a totally redesigned online component. Brothers in Arms Hell's Highway — next generation: The classic authentic, squad-based combat series explodes on next-generation hardware, offering unprecedented graphics and features. © 2008 Gearbox Software, LLC. All Rights Reserved. Published and distributed by Ubisoft Entertainment under license from Gearbox Software, LLC. 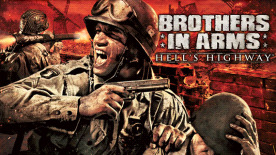 Brothers In Arms Hell’s Highway is a trademark of Gearbox Software and is used under license. Ubisoft, Ubi.com, and the Ubisoft logo are trademarks of Ubisoft Entertainment in the U.S. and/or other countries. Gearbox Software and the Gearbox logo are registered trademarks of Gearbox Software, LLC.